I have just returned home from a week of travels around the UK, with a brief reprieve before I head to France (who says students don’t do any work?). Ever since making the move to the US – and then back again – I’ve become a firm believer in the benefits of travel as a way to enrich your life. Even a weekend trip 6 miles away can have a surprisingly calming effect. Travel also affords a great opportunity to explore a different type of literature. 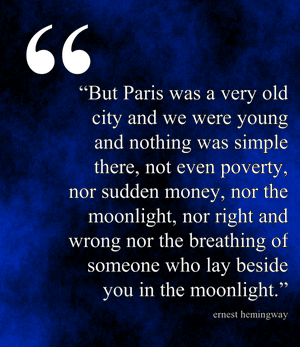 In preparation for my trip to Paris, I am working my way through Ernest Hemingway’s A Moveable Feast – a review will, of course, be coming to The Book Habit shortly. In the meantime, however, I leave you with this Monday Musing.